You could land this thing in less room than a city block with a 25 MPH stall speed! perhaps not too useful as a military aircraft, still completely valid for use by civilians, smugglers, police and spies! FIRST cousin to the autogiro, a new circular-wing airplane recently tested in Chicago is so simple in operation that one who has never been off the ground can learn to fly it in thirty minutes, according to the inventor. Instead of the conventional wing structure, the new plane has a huge saucer-like disc trussed above the fuselage. At the rear of the wing are two ailerons which enable the plane to land at low speeds. A small 110-h.p. Warner motor develops a speed of 135 miles per hour. The ship climbs at an angle of 45 degrees and lands at a speed of 25 miles per hour, coming to a halt within a few feet. The plane’s peculiar fifteen-foot wing is attached to a conventional fuselage by braces like those of the usual high wing monoplane. The ship carries two passengers and can be housed in a hangar not much larger than the ordinary garage. 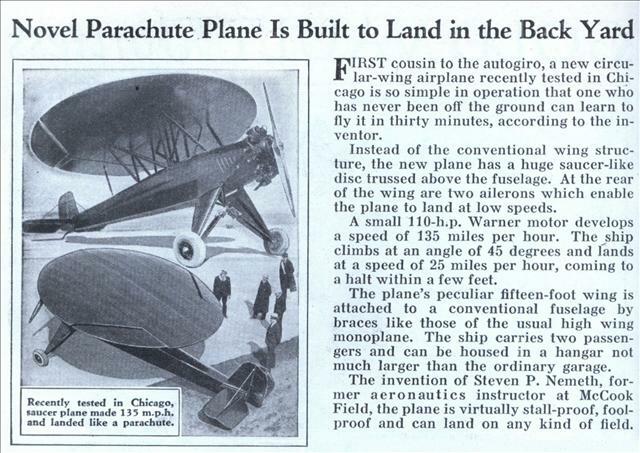 The invention of Steven P. Nemeth, former aeronautics instructor at McCook Field, the plane is virtually stall-proof, foolproof and can land on any kind of field.